A 70-year-old woman was admitted to our cardiology department for acute pulmonary edema. Her medical history was unremarkable for cardiovascular risk factors and previous cardiac disease. Ten-year ago, she was diagnosed a non-Hodgkin lymphoma, treated with CHOP (Cyclofosfamide 750 mg/m2 for 6 days, doxorubicin cumulative dose of 500 mg/m2, vincristine 1,5 mg/m2 for 6 days, and prednisone 100 mg orally for 5 days) chemotherapy regimen plus mediastinal radiotherapy (XRT) of 40 Gy completed 9 years ago. One year before, she was diagnosed chronic myeloid leukemia, treated with imatinib mesylate (600 mg orally once a day). Transthoracic echocardiography revealed a dilated and globally hypokinetic left ventricle with severe impairment of systolic function (ejection fraction [EF] 25%) [Figure 1]a, thickening and hypomobility of aortic cusps with mean/peak pressure gradient of 21/30 mmHg and a continuity equation derived aortic valve area (AVA) of 0.5 cm2 (indexed stroke volume 16 mL/mq). There was also a moderate-severe functional mitral regurgitation with elevated systolic pulmonary artery pressure (PAPs). 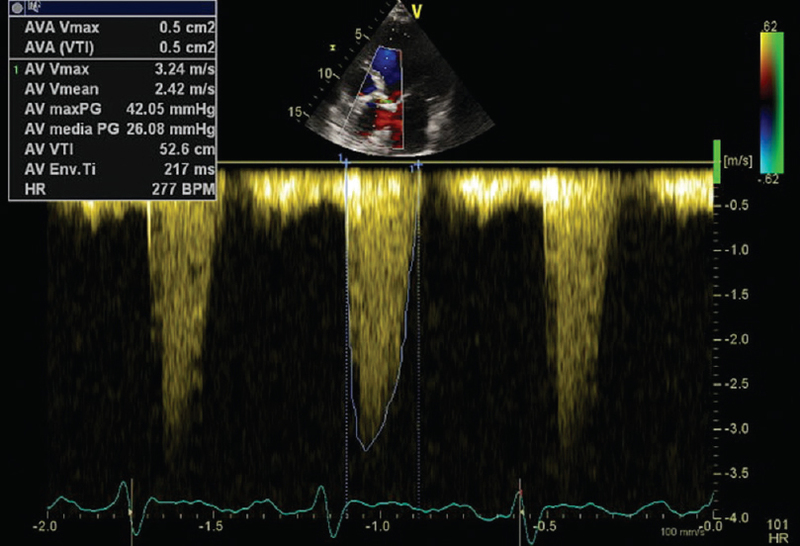 Transesophageal echocardiography confirmed the severity of mitral regurgitation and showed a planimetric AVA of 0.7 cm2 [Figure 1]b. Low-dose (up to 20 ug/kg/min) dobutamine-stress echocardiography (DSE) confirmed the severe degree of AS, with only a slight increase of mean/peak pressure gradient (26/42 mmHg), an AVA of 0.5 cm2 and no flow reserve (indexed stroke volume 18.5 mL/mq) [Figure 2]. There were no significant lesions at coronary angiography [Figure 3]a and [Figure 3]b, while right heart catheterization showed moderate increase in PAPs. After Heart team discussion, the patient underwent TAVR with a balloon-expandable prosthesis (Sapien 3, Edwards Lifesciences) with good final result [Figure 3]c. The patient was discharged with aspirin, clopidogrel, beta blocker, and ACE inhibitor therapy. At 6 months' follow-up, the patient referred an improvement of dyspnea (NYHA II), with no residual transprothesic gradient and a moderate mitral regurgitation, but developed LBBB with QRS width of 150 ms. In accordance with the current guidelines, she underwent CRT-defibrillator (CRT-D) therapy. At 12 months' follow-up after CRT-D, the patient referred no more episodes of congestive heart failure, an impressing recovery of the left ventricle systolic function (EF 51%, Global Longitudinal Strain −15% [Figure 4]a and [Figure 4]b and a significant reduction of mitral regurgitation to a mild degree. Spallarossa P, Maurea N, Cadeddu C, Madonna R, Mele D, Monte I, et al. A recommended practical approach to the management of anthracycline-based chemotherapy cardiotoxicity: An opinion paper of the working group on drug cardiotoxicity and cardioprotection, Italian Society of Cardiology. J Cardiovasc Med (Hagerstown) 2016;17 Suppl 1:S84-92. Jaworski C, Mariani JA, Wheeler G, Kaye DM. Cardiac complications of thoracic irradiation. J Am Coll Cardiol 2013;61:2319-28. Tamura A, Takahara Y, Mogi K, Katsumata M. Radiation-induced valvular disease is the logical consequence of irradiation. Gen Thorac Cardiovasc Surg 2007;55:53-6. Donnellan E, Masri A, Johnston DR, Pettersson GB, Rodriguez LL, Popovic ZB, et al. Long-term outcomes of patients with mediastinal radiation-associated severe aortic stenosis and subsequent surgical aortic valve replacement: A matched cohort study. J Am Heart Assoc 2017;6. pii: e005396. Dijos M, Reynaud A, Leroux L, Réant P, Cornolle C, Roudaut R, et al. Efficacy and follow-up of transcatheter aortic valve implantation in patients with radiation-induced aortic stenosis. Open Heart 2015;2:e000252. Bouleti C, Amsallem M, Touati A, Himbert D, Iung B, Alos B, et al. Early and late outcomes after trans-catheter aortic valve implantation in patients with previous chest radiation. Heart 2016;102:1044-51. Rickard J, Kumbhani DJ, Baranowski B, Martin DO, Tang WH, Wilkoff BL. Usefulness of cardiac resynchronization therapy in patients with adriamycin-induced cardiomyopathy. Am J Cardiol 2010;105:522-6.